Last week I started sharing with you a list of upcoming Cons for 2014. Please understand that the list I give you is not exhaustive, but you can find out about Cons the same way I do on Upcomingcons.com. The two Cons I want to share with you this week are the ones that my hubby and I will be attending this spring. First up, is my “first love” Con. This is the first Con that I ever attended and had the time of my life. If you’ve hung out on my website for the past 18 months, then you’ll know that I’m referring to TimeGate! Last year was the 50th Anniversary of Dr. Who. This year is the 20th Anniversary of StarGate. The movie which started the iconic franchise first came out in 1994. Guests this year include Paul McGillion, David Bates, Paul Kasey, Gareth David-Lloyd (Torchwood), Lt. Moxie Magnus, The Ken Spivey Band, one of my favorite comic book guys, Kelly Yates; my favorite podcast Earth Station One and award winning author, and now actor, Bobby Nash. This Con is growing by leaps and bounds. And as this was my first Con, I am planning on being a guest at this Con in the next two years. Next, let me share with you a Con that is making the rounds of the US this year in such cities as Sacrament, St. Louis, Atlanta and Portland, just to name a few. This Con stops in 16 different cities for their 2014 season (which includes 2 January 2015 dates). Check out their website to find a city and date near you. 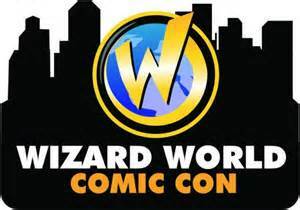 Wizard World Con doesn’t necessarily hit the same cities each year, so take advantage of them if they are coming near you. I know we will. My hubby and I will be attending the Atlanta Comic Con May 30-June 1. If I don’t do anything other than sit in a corner in the ballroom all day, I will be happy. You see, one of my favorite actors will be there…Nathan Fillion aka Captain Malcolm Reynolds! He’s all I really care to see that weekend so I will be happy. However, for those of you interested in other stuff in Atlanta and in other cities, Stan Lee will be in Sacramento, there will be Walking Dead actors, Summer Glau, Matt Smith (Dr. Who) in Louisville, Cosplay Conests, TV, Movies, Games, Exhibits, and so much more. Check their website for weekend and day tickets. Come back and see me next week when I give you my wish list of Cons that I want to visit within the next 5 years.